Huntsville lies along the Tennessee River in north Alabama, the river that once transported cotton and made the city prosperous. It has one of the largest collections of Antebellum homes in the country and still has a quaint town square that boasts a frozen-in-time hardware store. In the 20th century rockets were transported on the river for the space shuttle and the entire NASA space program. 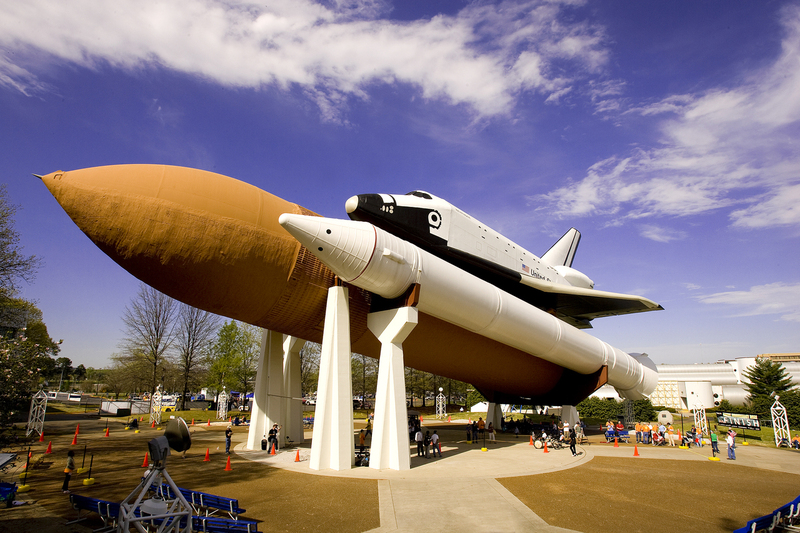 Huntsville is known nationwide for its space and rocket technology at the Marshal Space Flight Center. Now visitors from around the country flock to the huge U.S. Space & Rocket Center, an interactive museum with fun activities for all ages. We have a rally rate of $25.50 for 50 AMP Full Hookups and $23.80 for 30 AMP Full Hookups, these rates are extended before and after the rally dates. There are 14 - 50 AMP and 10 - 30 AMP Full Hookup Sites. Huntsville is a city full of beauty and history with something for everyone! Stroll the historic district streets, view historic antebellum homes, meander through art shops and art museums or enjoy the beautiful Huntsville Botanical Gardens. Military history comes alive at the U.S. Veterans Memorial Museum, and for you Foodies treat yourself to exquisite Southern Cuisine. Cost for this rally is 90.00 per person . For Non-SECC attendees please add $35.00 per coach. RALLY FEE IS $90 PER PERSON (INCLUDES DINNER ON WEDNESDAY 5/16, TOUR OF THE U.S. SPACE CENTER WITH A BUS TOUR OF THE REDSTONE ARSENAL* ON THURSDAY 5/17, FREE TO EXPLORE HUNTSVILLE ON 5/18, PRIVATE TOUR OF CATHEDRAL CAVERNS IN THE MORNING, THEN CATERED DINNER ON 5/19. *You must be a U.S.A. citizen to do the bus tour. The Redstone Arsenal takes you back to WWII in the exciting field of Nuclear Weaponry and Rockets! Where are y'all? Send us your photos and news to share. We know many of you are down in Florida. Here is a shot of the Sanders and Conways having lunch with the Harpers and Cassinghams at Guanabanas in Jupiter.The Harpers have sold their coach and are now living full-time in St Andrews in Boca Raton. Mary Lou and Jack Cassingham flew down for a couple days to visit us all. 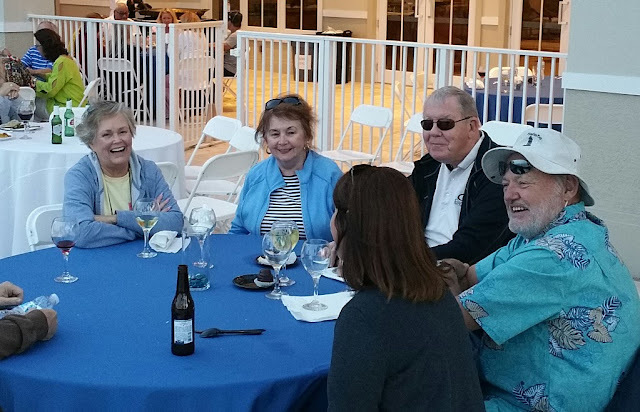 While staying at Palm Beach Motorcoach Resort (formerly Jupiter-Palm Beach) the Conways and Sanders were joined by Stevie and Hank Giffin who are on their way to their annual Navy reunion in Key West. Shown below are the couples at the resort poolside party. We all had a great time at our rally last week. 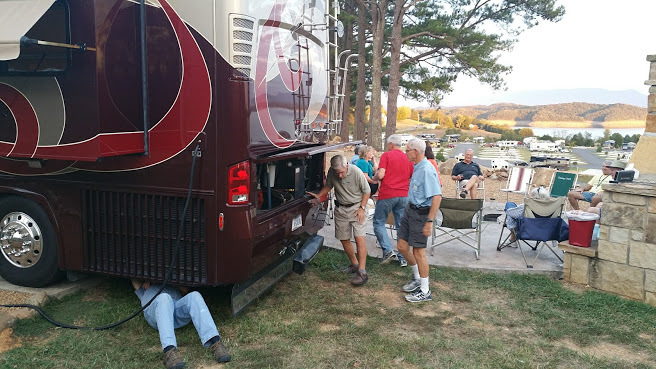 It all started off with a pre-rally at the new Anchor Down RV Resort in Dandridge TN. It's just west of Sevierville TN but quiet and so beautiful there. 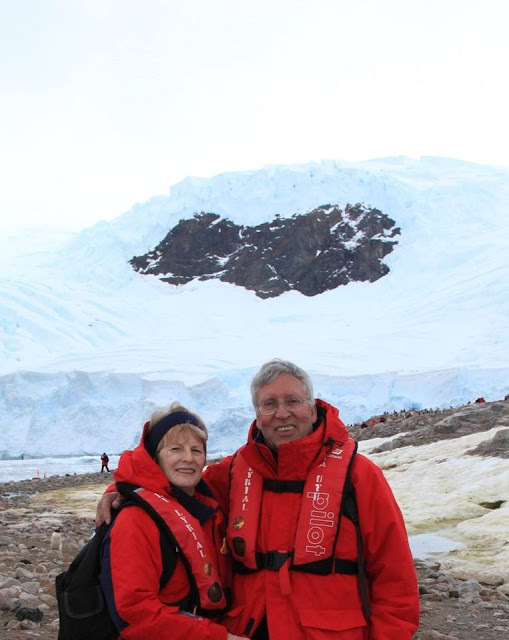 Our Rally Coordinator Charles McGairty had recommended this new place and we all had a wonderful stay. Most of us were in the upper section with the best views. These stone fireplaces were at each spot. On the pre-rally were Sanders, Bordes, Cassingham, Conway, and Loftfields. ​The five of we SECCers were joined by 18 Nor'Easters who had caravanned down to join us before heading up to Lexington. It was hard to leave such a peaceful place. The Kentucky Horse Park Rally was a joint SECC rally with CCI. Our own Velma & Hollis Williams' permanent home is in Lexington and Velma headed up the organizing of this amazing rally. Velma was really enjoying herself. She retired this year.. once again...and says some of these places she had never visited even though she grew up in Lexington. ​We were able to fit in a social hour for SECC. We had 18 coaches at the rally and two who could not make it. ​Buddy and Ann Bordes have an outdoor TV so it was a great place to get together and still allow the football fans to follow their game. By the way, that lady sitting on the left with the curly blond hair is Marta. Her hair has grown back in curly! ​downtown Lexington, a drive along country roads with the iconic stone fences, and ​Buffalo Trace bourbon brewery, the oldest one in the country started back in the 1700s. One of the best tours was the Toyota manufacturing plant, their largest at over 1300 acres, the size of 156 football fields. We were glad we were driven around in a tram. It produces 2,000 cars a day. We were not allowed to take any photos. Could not even take a cell phone into the plant. It was incredibly enormous and busy all around and overhead. ​They aren't just an assembly plant like most car plants are now. They even do ​their own ​stamping. The stud farm visit was fascinating. It is a serious business. This stallion, Shackelford, ​was brought out for us to see fairly close. Stallions are very hard to handle and he was constantly trying to bite his handler. Shackelford commands a $20,000 stud fee and he must perform 3-5 times a day,​ almost every day of the year. However, they are only paid once each foal is born strong and healthy. That is only around 60% of the births. ​We lunched at Buffalo Trace Brewery & the toured the buildings. ​It was a good thing we came in 3 buses as there were whole cases of bourbon and their new Bourbon cream that came home with the members. him. Last time we saw Chris his legs were giving him a bad time, but his new braces are making a big difference. It was such a nice end to our rally. and your friends busy and entertained. will be one day early.